White House Proposes New Tax on Oil Companies -- Should Government Tax Oil Industry Over Gulf of Mexico Spill? 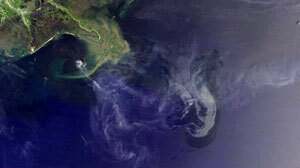 In this handout from NASA, an oil slick from the sunken Deepwater Horizon drilling platform is seen off the coast of Louisiana May 10, 2010 in the Gulf of Mexico. ABC News has learned that in the last few days what is coming out that broken well at the bottom of the Gulf of Mexico is changing. President Obama is giving his support to legislation that would raise taxes on oil companies and increase the liability they face in the event of an oil spill. The legislation would increase the 8-cent per barrel tax on oil companies to 9 cents immediately. "While we are asking for additional funds, in some cases, the federal government will not relent in pursuing full compensation for the expenses it has occurred and damage caused by the spill," White House energy adviser Carol Browner said in a conference call yesterday. BP has promised to pay for the cleanup costs and efforts to stop the leak, which continues to pour thousands of gallons of crude into the Gulf of Mexico daily. The additional tax on all oil companies would go toward the Oil Spill Liability Trust fund, which is intended to cover costs to clean up spills, and it could generate hundreds of millions of dollars in additional tax revenue. Some have suggested that the tax is a form of punishment for oil companies, as the BP spill moves closer to shore. Our question to you today: Should the government impose new taxes on oil companies to cover the clean-up of spills? Should Oil Companies Face New Taxes After Gulf of Mexico Spill?